In May 1771, an armed rebellion of backcountry farmers — called Regulators— battled against royal governor William Tryon and his militia. During the years leading up to the American Revolution, many North Carolinians became strongly discontented with the way the provincial government was handling the colony's affairs. Grievances affecting the daily lives of the colonists included excessive taxes, dishonest sheriffs, and illegal fees. In response, a group of "Regulators" was formed, who took a more radical stand against the Governor. Governor Tryon, in turn, had to bring the backcountry revolt to a speedy conclusion. 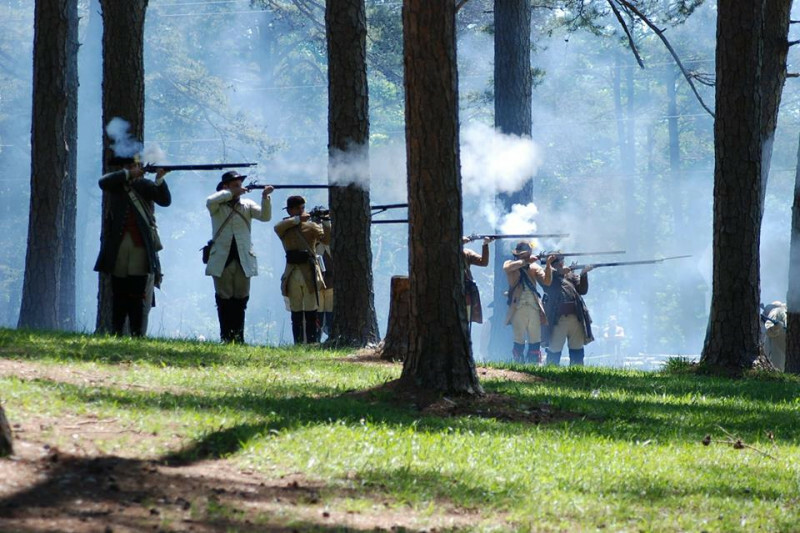 And so the Battle of Alamance began on May 16th after Governor Tryon ordered his militia to fire upon the Regulators, who had rejected the Governor’s order to disperse peacefully. Though the rebellion was crushed, the boldness displayed by reformers opposed to royal authority provided a lesson in the use of armed resistance, which patriots employed a few short years later in the American War for Independence. Regulators embodied the spirit of American independence, self-reliance and resiliency. The State of North Carolina has preserved 60 acres of these battleground lands as a State Historic Site, open to the public. Two tracts of land adjacent to the Site are now up for sale. These lands include the actual epicenter of the battle in addition to lands utilized by Regulators during the leadup to the battle, and their retreat and triage afterward. Please help the NC Literary and Historical Society in safeguarding a culturally and historically valuable battlefield from encroaching development! The Alamance Battleground State Historic Site in Burlington, North Carolina is tucked between the growing cities of Greensboro and Durham. As the value of the land continues to appreciate in this sprawling town, it is only a matter of time before the tracks of land are sold to a developer. Acquisition of the property will, in large measure, help prevent such residential or commercial developments from encroaching on this historical site. Preventing the urbanization of the site is critical for an authentic interpretation of colonial frontier life, circa 1771. Historic interpreters and reenactors battling against a backdrop of new homes or a strip mall cheapens the educational integrity of the site. Most importantly, the site was a battleground and many men lost their lives. Nine members of the Governor’s militia were killed and 61 wounded. The Regulator losses were much greater, though exact numbers are unknown. Governor Tryon took 15 prisoners; seven were hung later. Preserving this land will honor the legacy of those who made early sacrifices that ultimately paved the path toward American independence. #Save Alamance and donate today! It gives me GREAT delight to inform you that yesterday, the Board of the Clean Water Management Trust Fund approved our grant application in the amount of $304,181! We now have a total of $406K -- enough funds to purchase the land and save it from development! A requirement of this grant application was that we had to match requested funding with private dollars. Through this site, we raised $12,000 (from online contributions and checks mailed in). That, in turn, helped us to raise an additional $90,000 from private foundations. Our combined $102,000 in private funding, coupled with the publicity from social media, demonstrated to the Board the tremendous amount of support from this project and leveraged yesterday's windfall. I cannot thank you enough for your support! We will be able to save North Carolina historic sites because of you. Thank you! Folks, the Clean Water Management Trust Fund Board will meet today at 2:30 pm to decide the fate of our pending $300,000 grant! Please keep this project in your thoughts! Great news! We received another $10,000 from the Covington Foundation! This brings our total amount to $102,728! The Clean Water Management Trust Fund has set a tentative date of November 15th to announce this year's grant recipients. If we are selected, we will receive another $300,000! Please continue to keep us in your thoughts and send us good vibes. Fingers (and toes, too) crossed that our grant receives funding. As most of you know, we were expecting to hear about the status of a pending $300,000 grant proposal today from the Clean Water Management Trust Fund. The Board of the Trust Fund has postponed the meeting date until further notice! The News & Observer wrote about the decision to hold off here: : https://www.newsobserver.com/news/politics-government/state-politics/article217667050.html. We hope the reschedule in the near future...but until then we wait and keep raising funds! Thanks for your continued support!